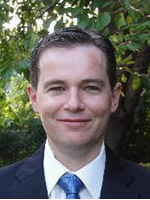 Tim Moore is an Assistant Professor of Economics. He received his PhD from the University of Maryland in 2012. He has published articles in several leading economics journals, including the Review of Economics and Statistics, Journal of Public Economics, and Journal of Law, Economics and Organization. Tim's specific areas of interest include disability insurance and its effect on recipients' health and labor force participation, issues related to alcohol and illicit drug use, and the relationship between income, economic activity and health.